The Mahabalipuram cave temples in India are very mysterious and contain loads of ancient history in the form of carvings. I find myself visiting these structures again and again, for some strange reason. In one of the monuments, we can see the oldest depiction of Bodhidharma, carved at least 1300 years ago. Bodhidharma is a very mysterious figure and has statues all over China and Japan and is considered the founder of martial arts at the Shaolin temple. He is an iconic figure among Buddhist monks. All ancient Chinese texts agree that he came from a foreign country, but experts are not sure if he was from Iran or from India. 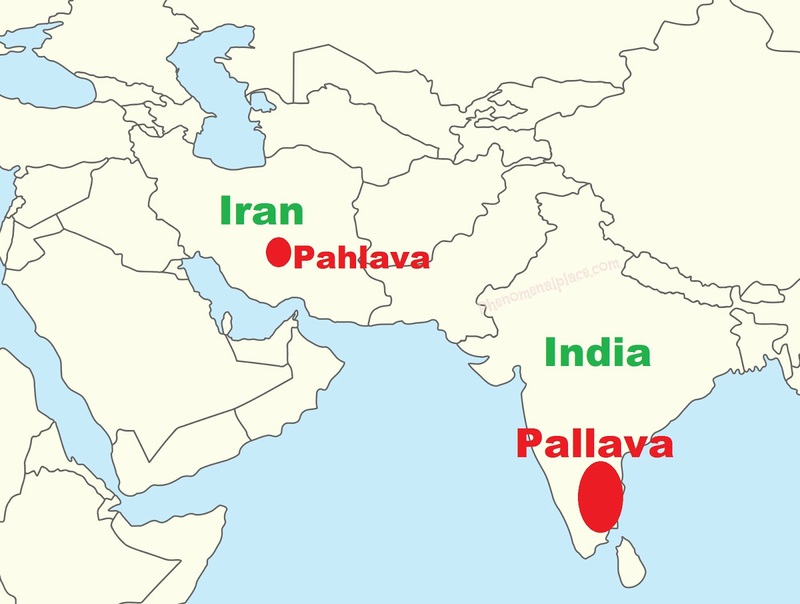 This confusion exists because Bodhidharma came from a kingdom called the Pallava Kingdom. 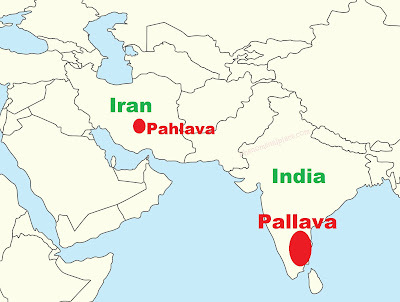 There are 2 kingdoms which existed under the same name, one in Iran and another in India. 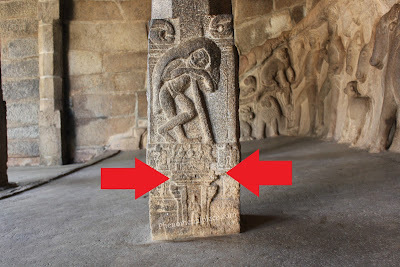 But this 1300 year old carving puts this confusion to rest, because it is the oldest carving of Bodhidharma that has ever been found and is found at the heart of the Pallava Kingdom in India which proves that he is in fact from India. We can see that he is wearing a long head dress that extends to his legs and is shown with a beard and mustache, typical of Bodhidharma's depiction in China and Japan. However, the most important feature is his extremely large eyes which are shown almost popping out. The reason for this is because Bodhidharma did not have any eyelids. This was his distinct feature. And we can see that Bodhidharma is shown holding a long stick, which was the only thing that he ever carried around. If we look around in this temple, this figure is sharply in contrast with all other figures in this monument. All other saints are clean shaven and are shown with their palms together. However, Bodhidharma is shown with a beard and mustache. This is definitely not a carving of a layman, because he is shown standing on top of a temple tower, such a depiction is only given to people who are saints or kings. And the beauty of this carving is that it shows Bodhidharma when he was young, because he left India in his early twenties. So, who was this Bodhidharma, and why did he travel to China? A Chinese disciple of Bodhidharma, by the name of Tanlin, clearly describes his origin in a book written around 550 A.D. He has written that Bodhidharma was a South Indian of the western region, and was the third son of a great Indian king. Also, the author Tsutomu Kambe mentions that Bodhidharma came from a city called (香至) Kang-zhi, which is actually pronounced as Kanchi in India. The city of Kanchi was the capital of Pallava Kingdom, which is located less than 50 miles from this carving. Bodhidharma's real name was Jayavarman, a prince of the Pallava dynasty, who renounced his luxuries to become a monk. He then traveled to China where he taught various specialties including meditation, martial arts and medicine. Don't forget to leave your thoughts in the comments section. Have a great day! Hello Sir. I have been greatly inspired by your work... Keep it up. But can you please tell me what do you mean by,"The reason for this is because Bodhidharma did not have any eyelids." I mean,if he didn't have eyelids he would be blind. Because any person without eyelids will become blind soon. May be because the artists lived in that period /place were lacking in the engraving of Eye lids or may be it might carved after constructing the pillers/construction so that if any small thing goes wrong while carving they abandon the work. I will soon visit that place and will to research like praveen Mohan sir. Great work. I like your videos. I found a similar sculpture in Gnayiru Gramam Pushparatheswarar Temple, Chakkarathazhvar about 1.5 hrs from Chennai. The temple is over 1600 years old and built by Pallavas. This temple is small in size but has baffling sculptures around 50 in number (half me half scorpion etc). The Bodhidharma sculpture you are referring to can be found in Ambal Sannidhi. Let me know how to post the picture of the sculpture I took in temple. Upload it in your Google drive and share the link here. I am eager to see them.